Artists, things or ideas that have inspired me. 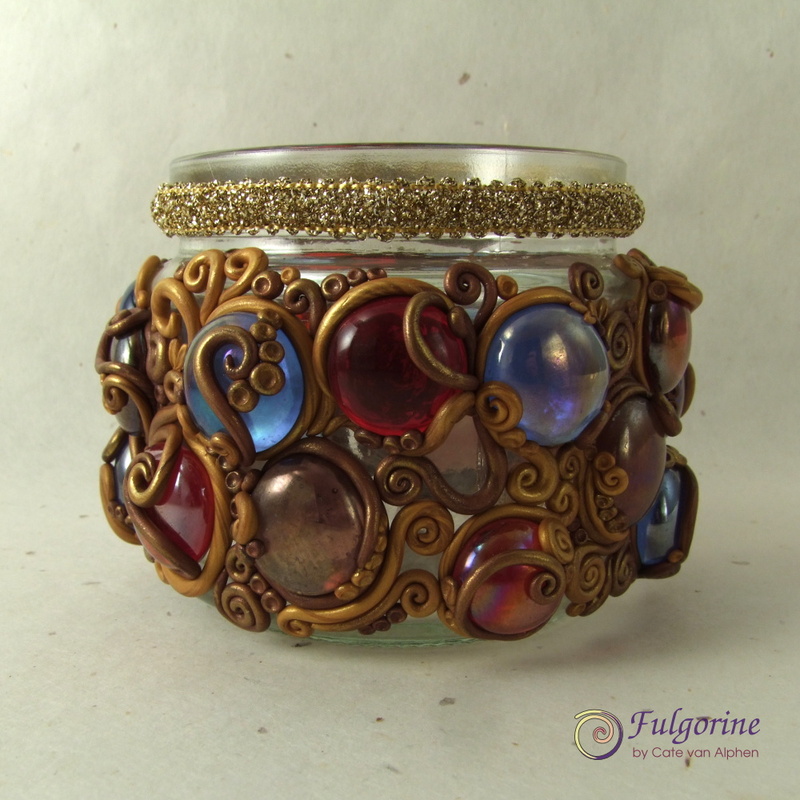 This week, for my 2016 Polymer Clay Challenge, I have finished the lantern I started back in week 10. 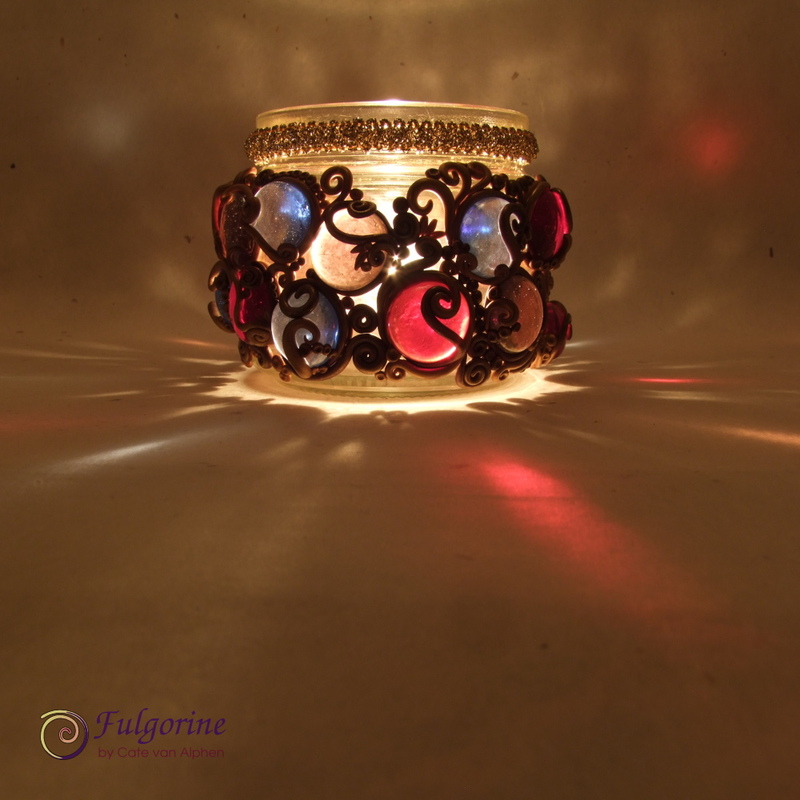 What I had in mind was something like medieval reliquary – all encrusted with gold and gems. Halfway through decorating the jar I thought of something that might make the snakes less clumpy looking, but I decided to continue as I had begun. It was a bit of an exercise in stamina. 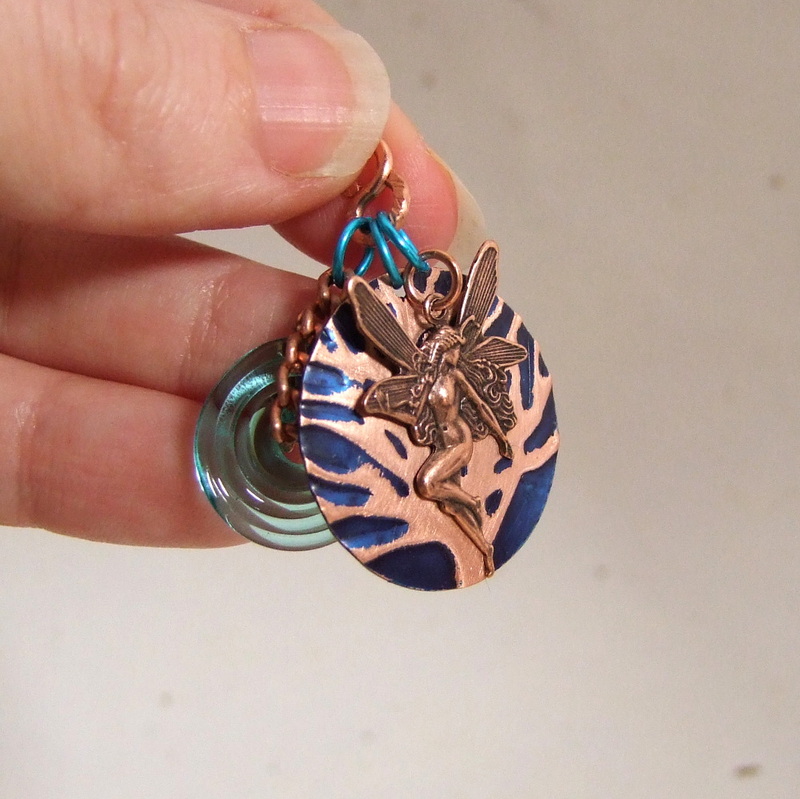 I’ll experiment on something smaller like nugget pendants to see if my new idea is an improvement. The ribbon around the top is still on probation. I didn’t want a big slab of polymer clay to hide the thread for the jar lid. 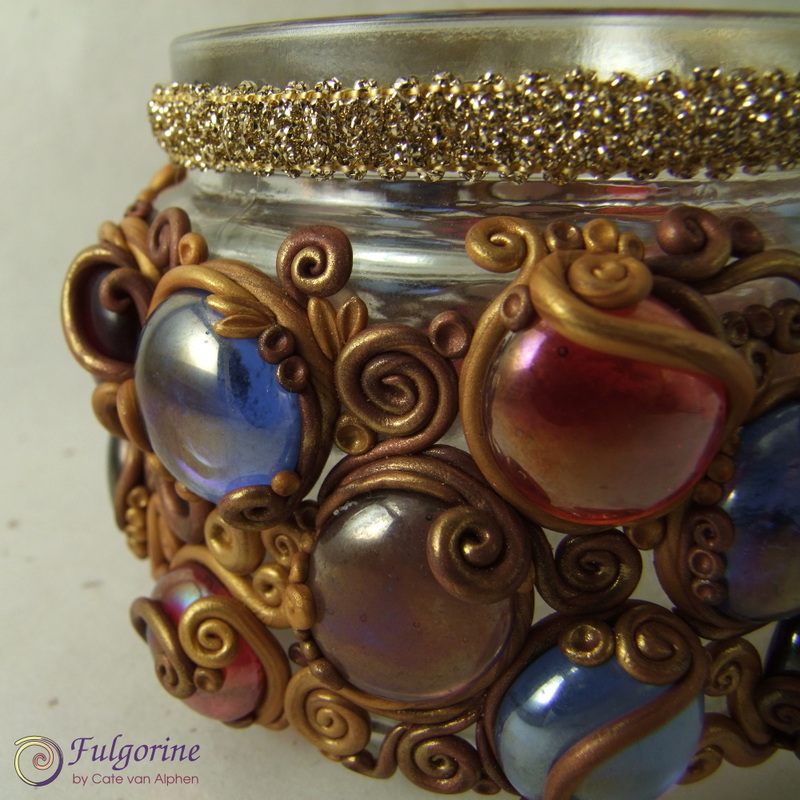 I had originally planned to wrap it with beads, however after working on the jar for 3 weeks, I just wanted something to finish it off quickly! 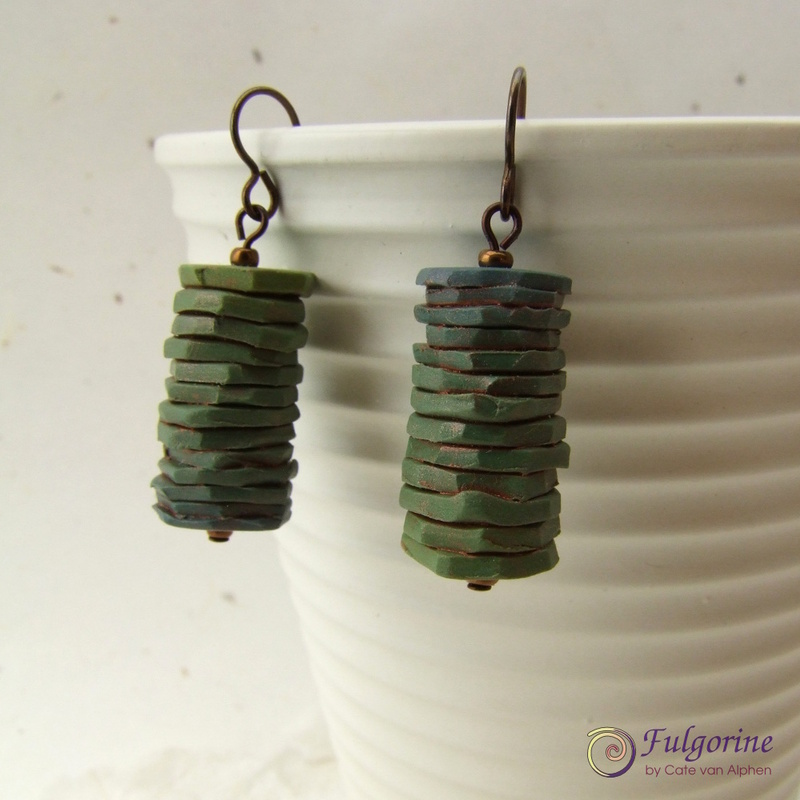 While I was working on the lantern I found these beautiful earrings by Anna Bragina. I thought they looked like an elegant take on the look I was going for. I like the minimal bezels. Why didn’t I think of that? I don’t know how to tell the age of the shards, but some of them look pretty old to me. I find it amazing to think that pottery and its use has not changed much in centuries. 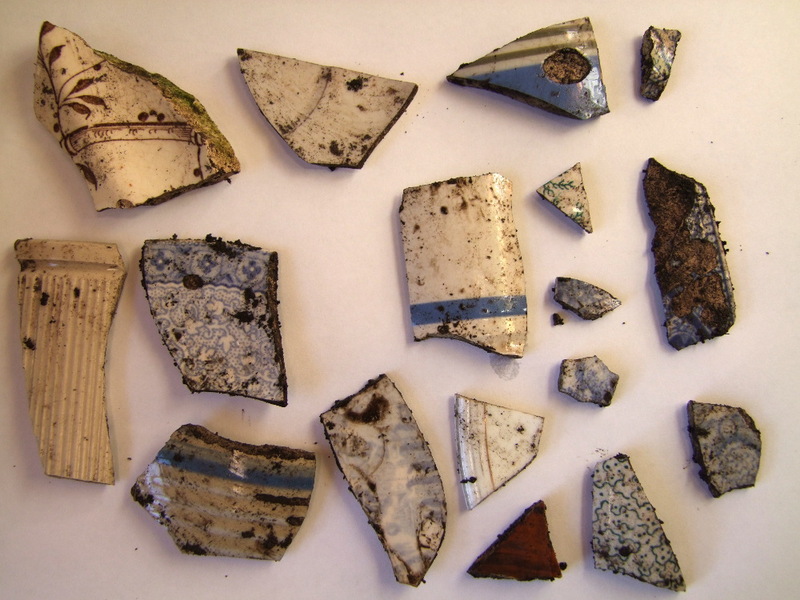 Perhaps 100 years ago some of these shards were used for someone’s Christmas dinner. I’ll clean them up and see if I can wire-wrap some of the pieces or incorporate them with polymer clay in pendants somehow. 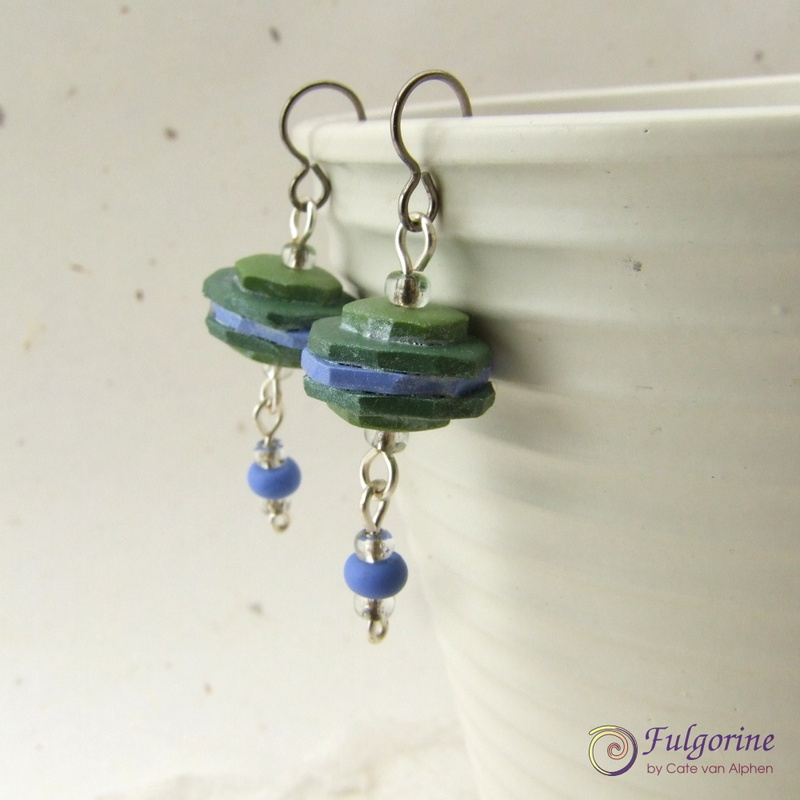 In preparation for the 2015 Polymer Clay Challenge I have created a page with details of what I intend to do, and some colour palettes to get me started. 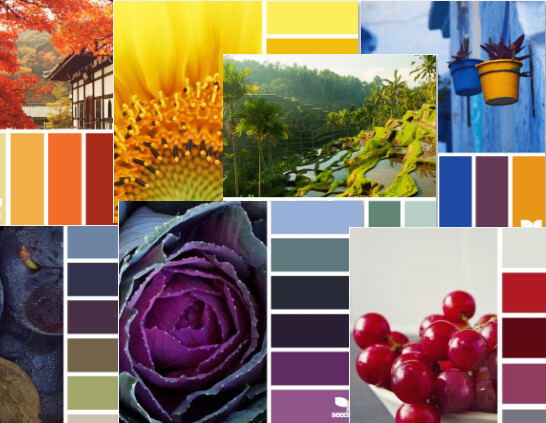 I’m starting with orange, because a) it’s the most difficult colour for me b) I want to work on warm colours when the weather is cold c) I want to work on yellow in the Spring (I’m thinking daffodils :)). 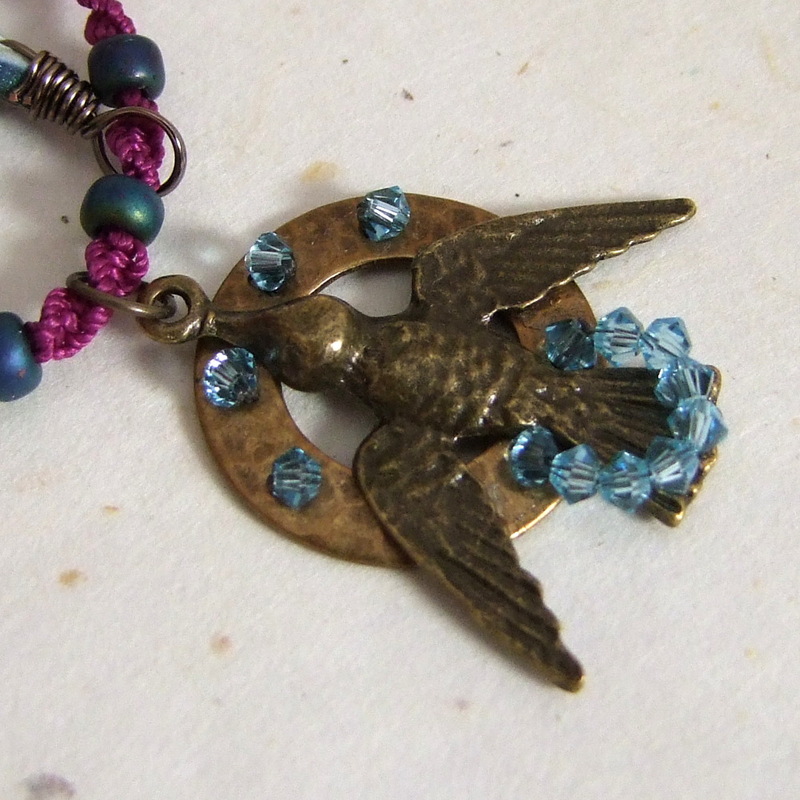 I used the bird charm I received from Chris Eisenberg to make a bracelet before I even took a picture of it. 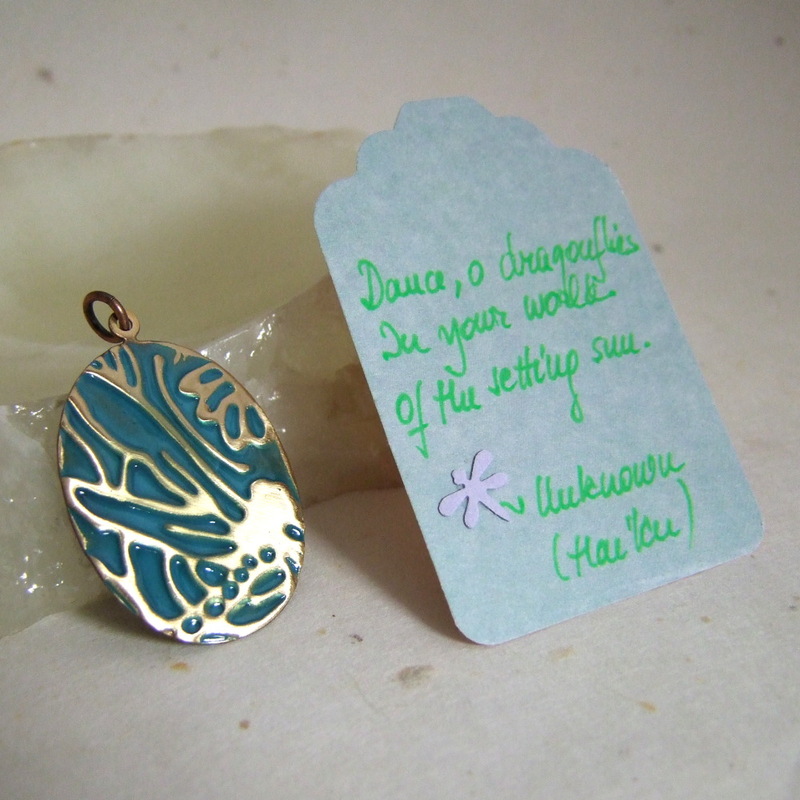 Have a look at the variety of charms on her blog, http://www.wanderware.blogspot.com – each one she made is different! 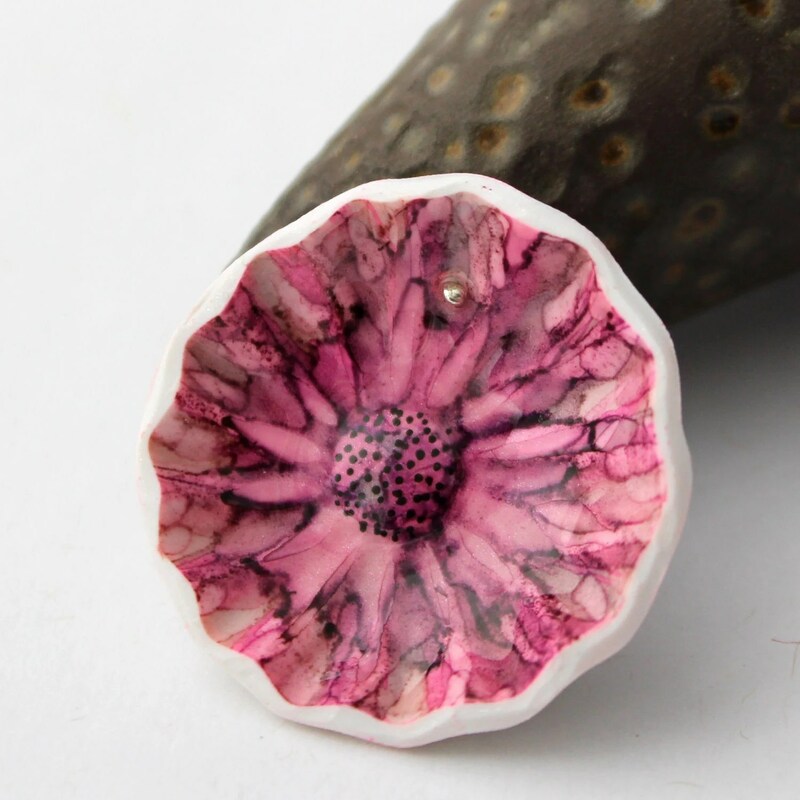 Elisabeth Auld’s bead looks like a magic garden. 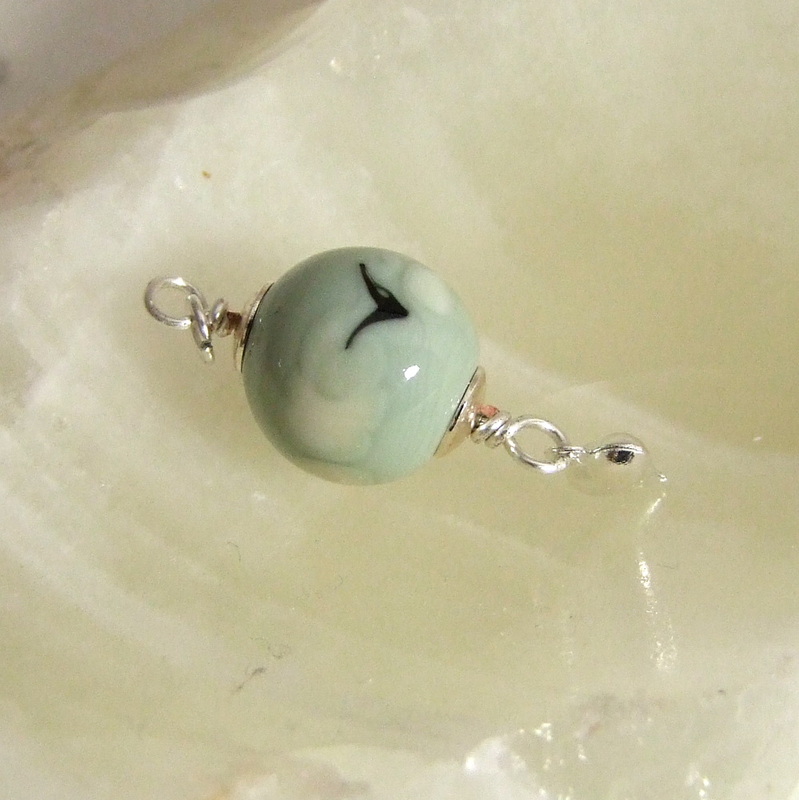 The charm on her blog features a sky blue lampwork bead. 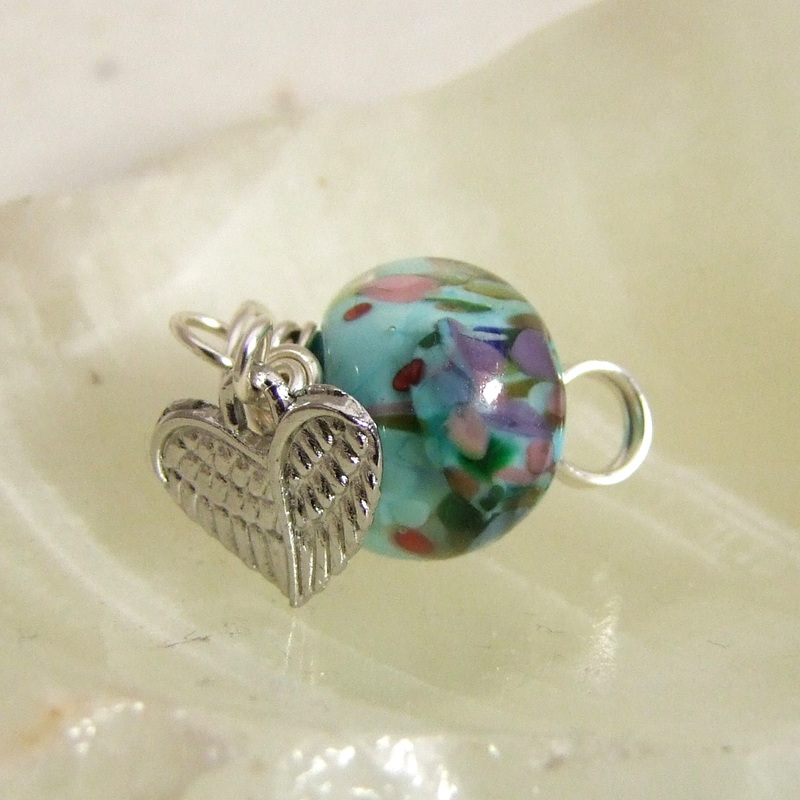 Have a look at her blog: http://www.beadsforbusygals.com and see the necklace she made featuring all the charms she received. 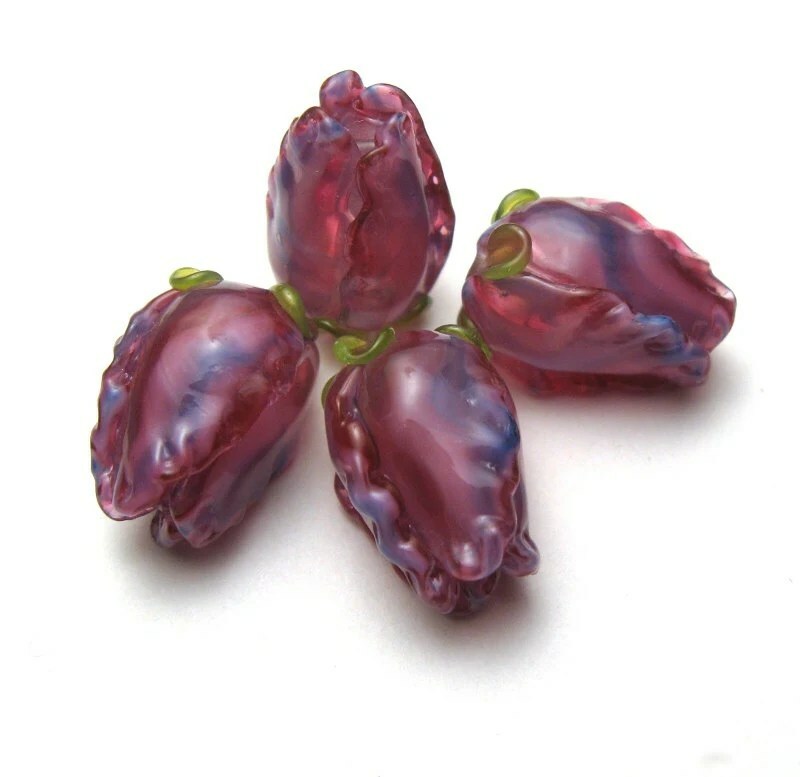 Renetha Stanziano’s Soaring Bubble Baubles are like a party in the shape of a bead. 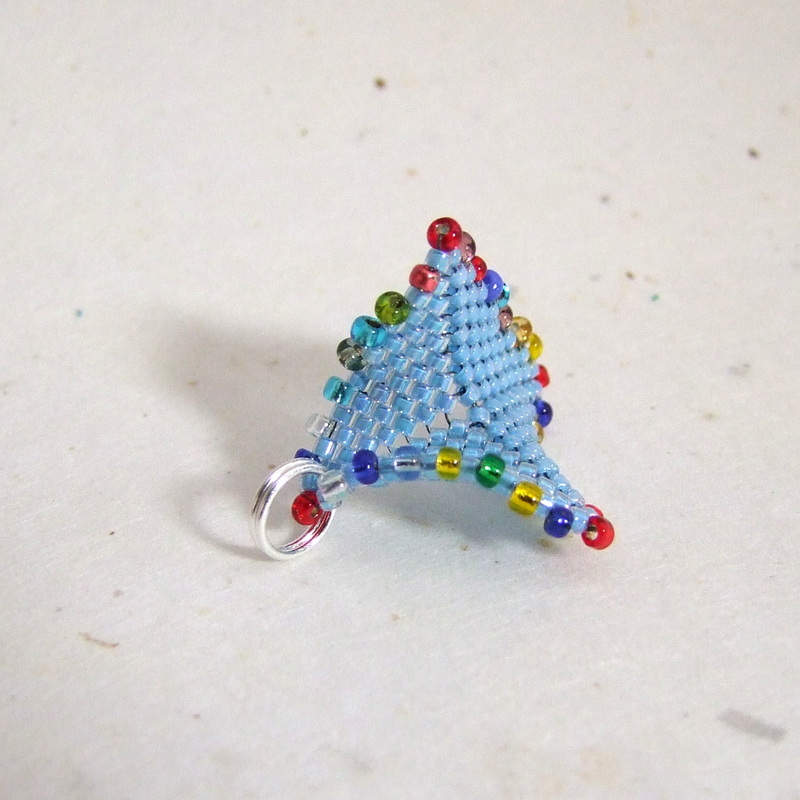 See them on her blog, http://www.lamplightcrafts.blogspot.com, each one is different! 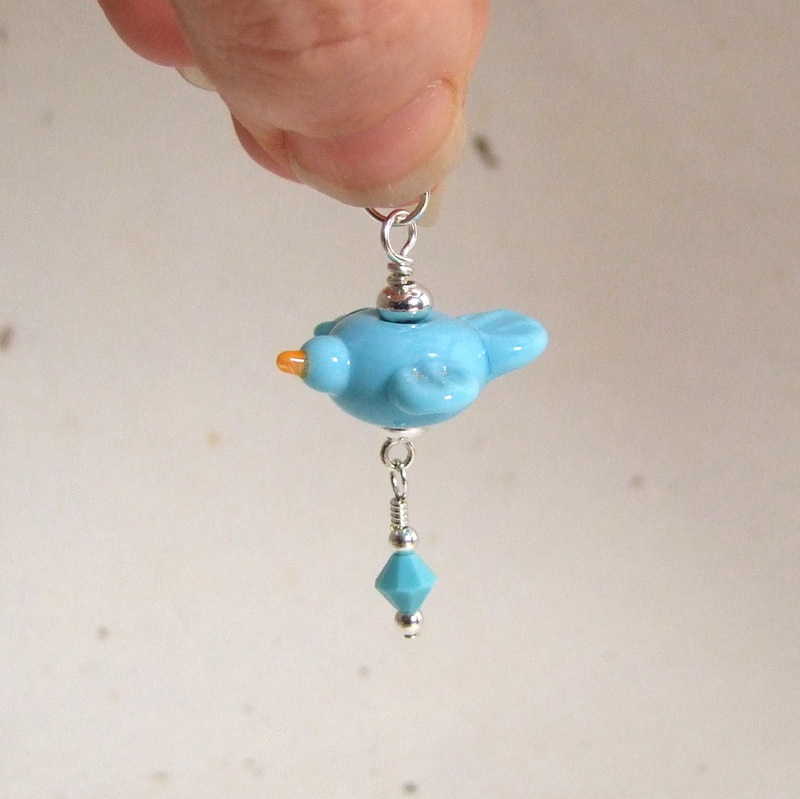 Susan Kennedy made adorable birdy charms. 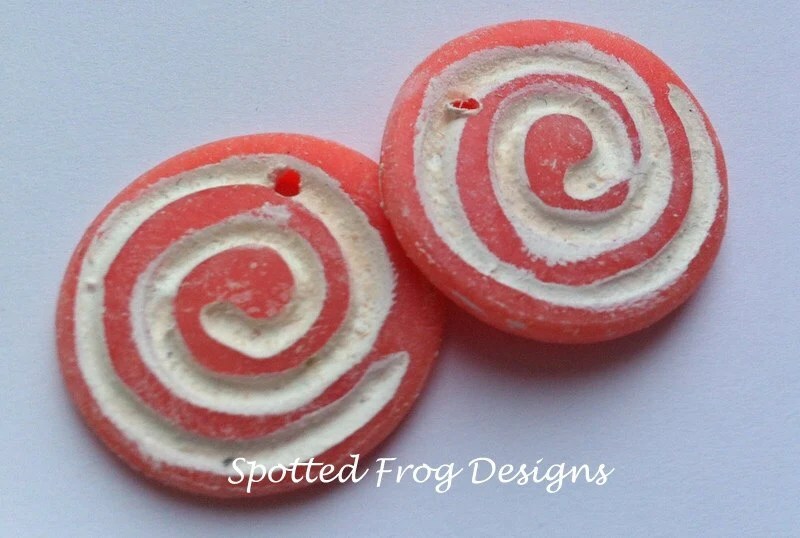 Have a look at her blog, http://www.suebeads.blogspot.com, to see them in other colours. 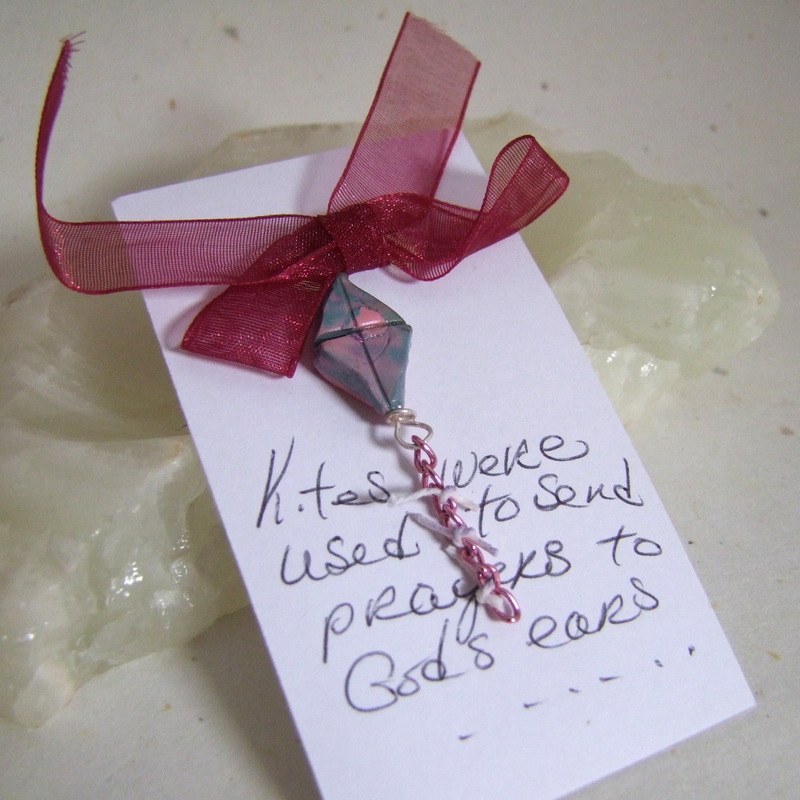 I received TWO charms from Toltec Jewels, each one with a wonderful story and featuring artist made beads. 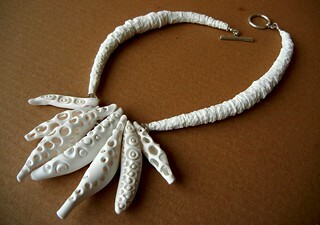 Have a look at her blog, http://www.jewelschoolfriends.com, to read all about her inspiration. 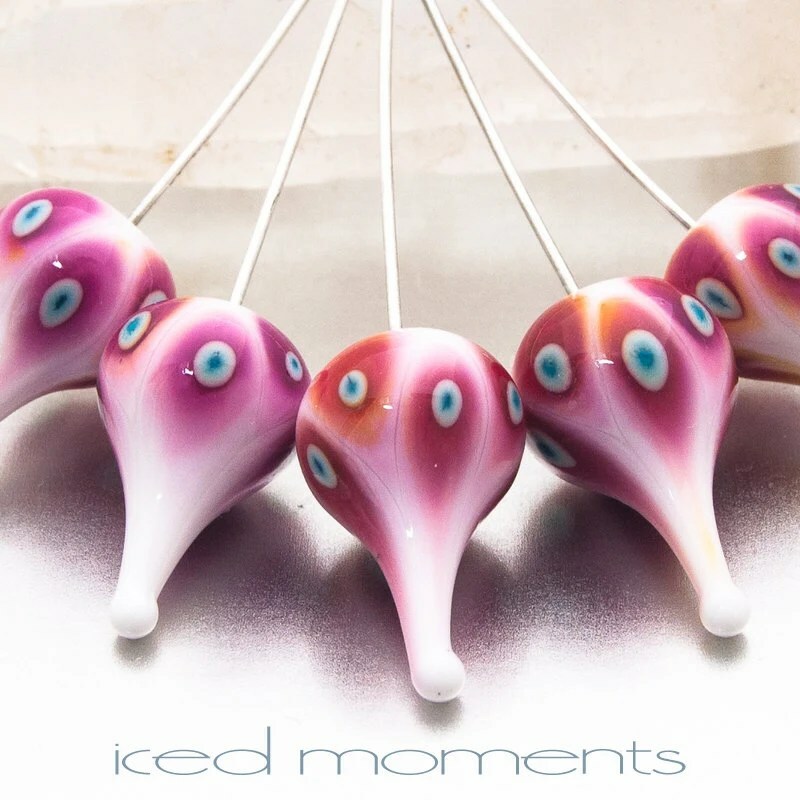 Remember Art Charms by these artists, and more, are still available to buy at the auction, and there are even more charming blogs to look at in the hop. 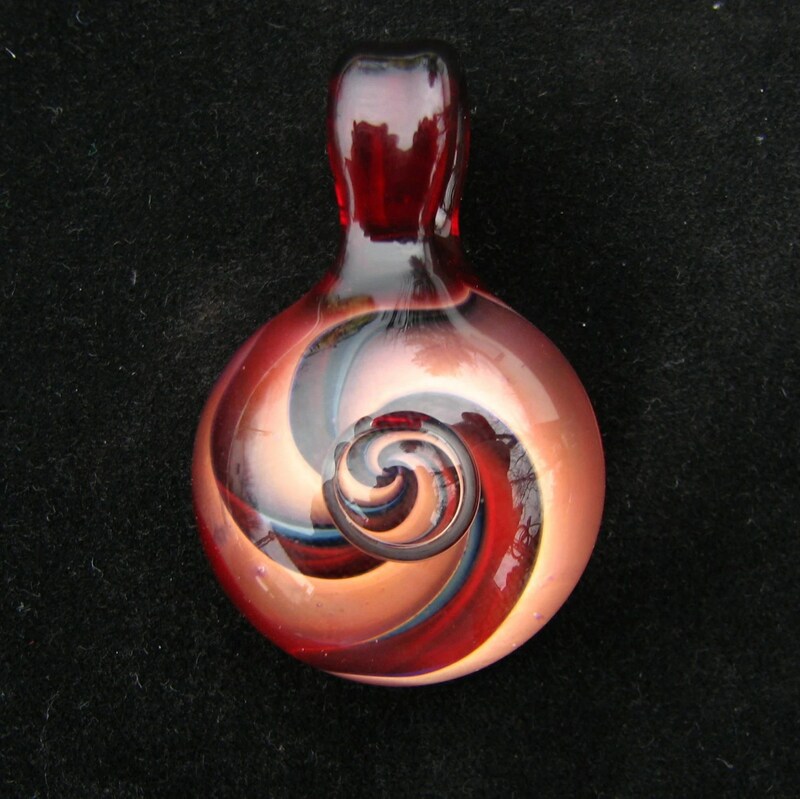 Also check out my giveaway to win one of my phoenix charms. 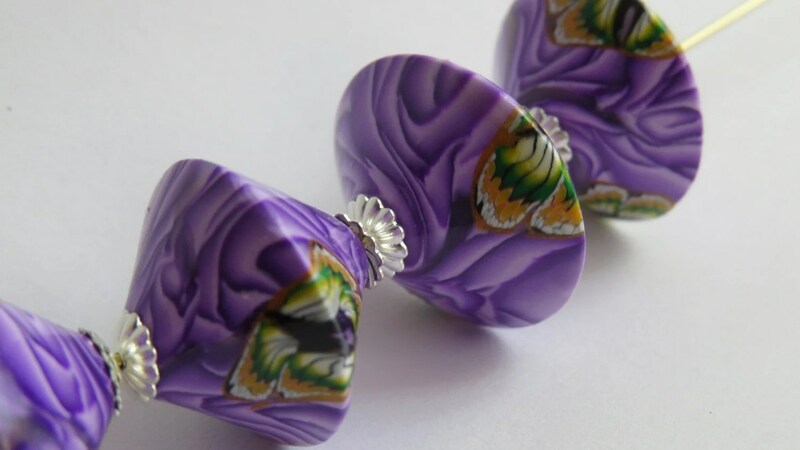 I’m happy to announce that some of my handmade polymer clay beads are now for sale at Big Bead Little Bead online bead shop. 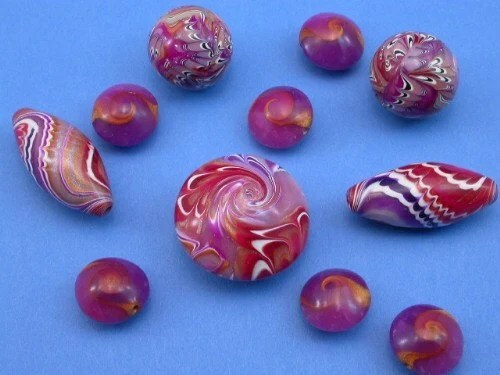 This is a UK based site which in addition to a wide selection of beads and findings, also features vintage and artist made beads. Here are some of my favourites from the Artist Made section. 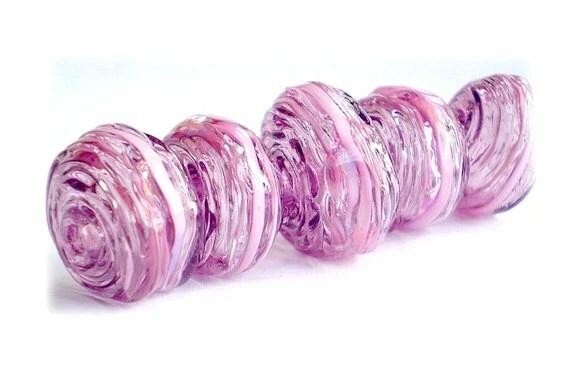 So, go forth and buy beads! 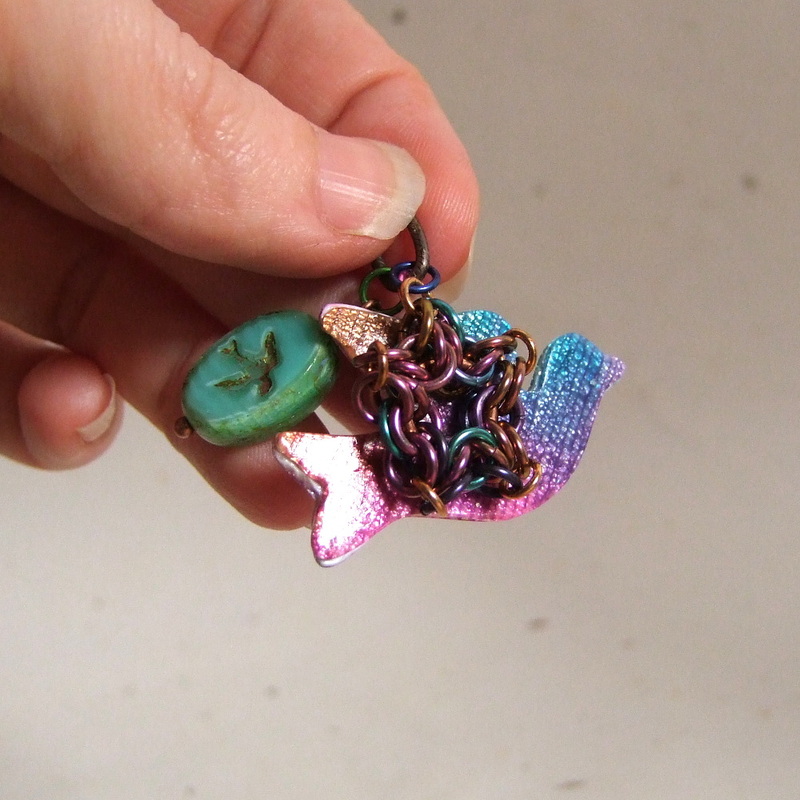 Inspired by the July Art Bead Scene challenge painting “The Little Mermaid” by Edmund Dulac. 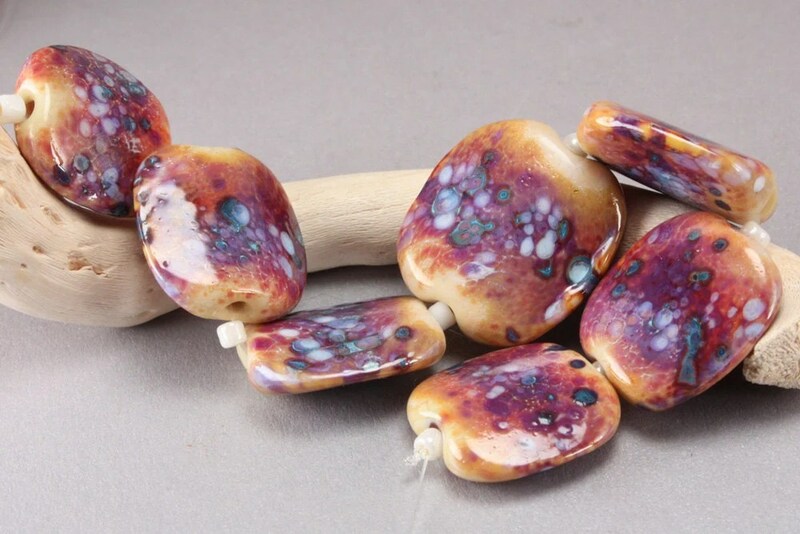 I’ve chosen a selection of sea themed artisan beads and components. Grungy wheels. 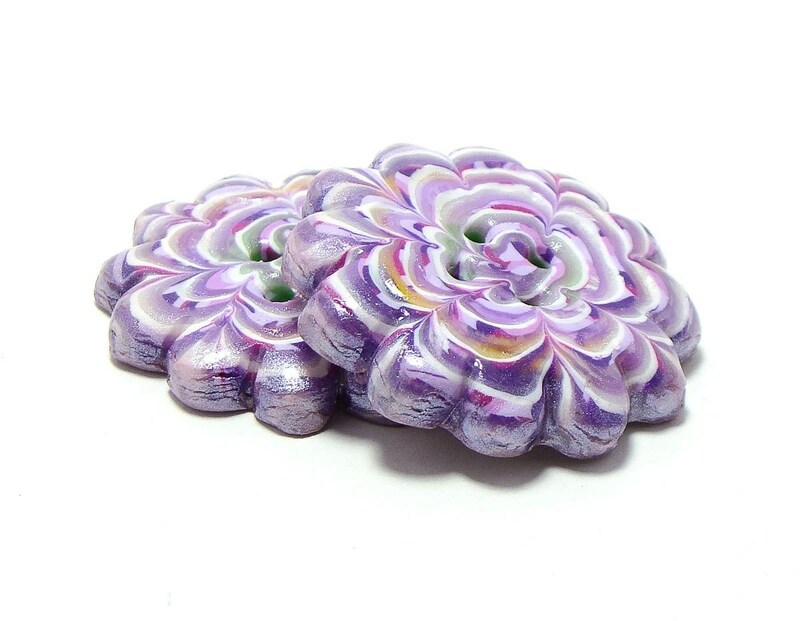 Large textured polymer rings. 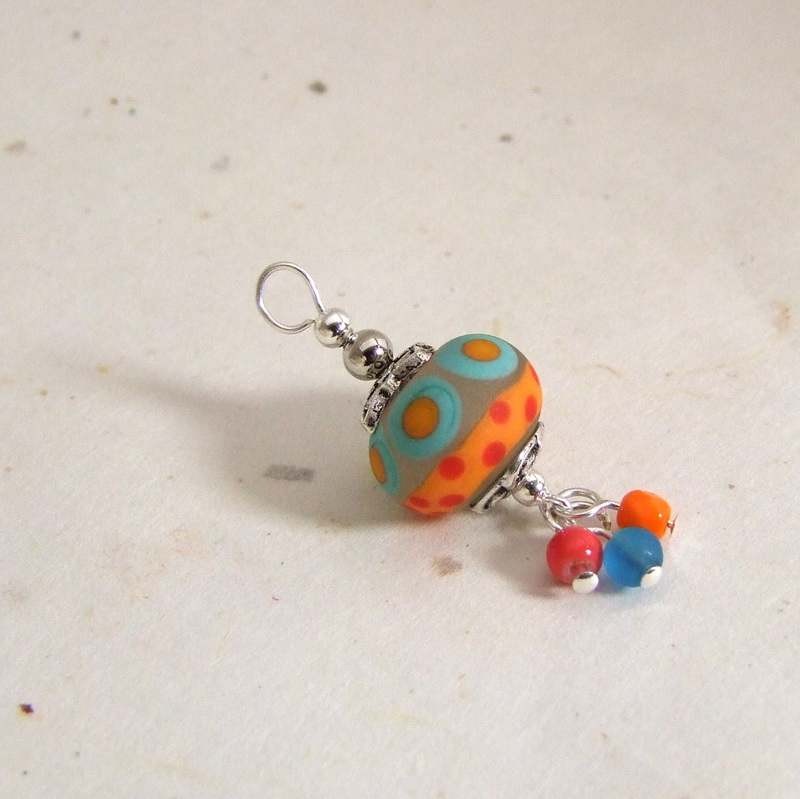 This month I have made another Etsy Treasury inspired by the Art Bead Scene monthly challenge painting. 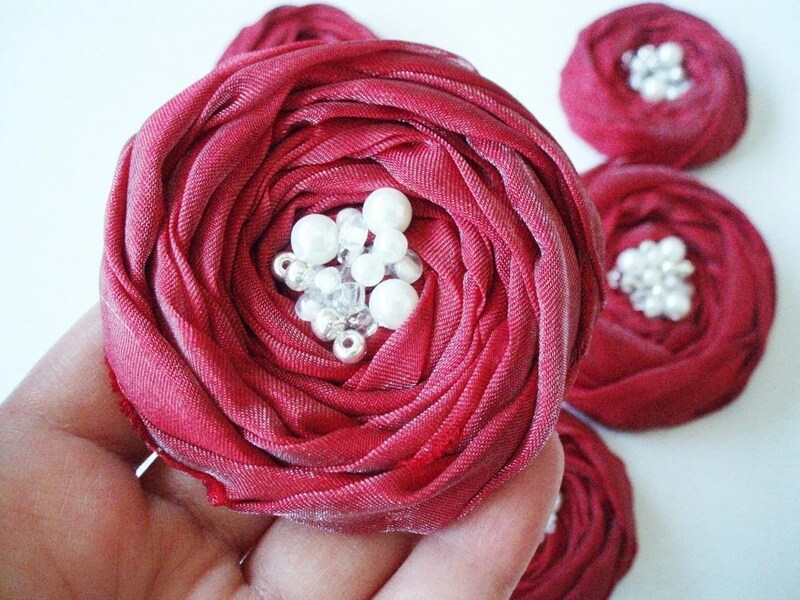 I loved the colours and the repeated spirals of the roses. I love the evocative title: “Honey Orange and Wild Horses”. Delicious!